Christian Lorck Schive was born in Trondheim on 10 May 1805. His parents, Adelgunda Christiania and Reinholt Johannes Schive, had several properties in and around Trondheim, including Elgeseter Estate. C. Lorck Schive worked as court recorder for the county governor before becoming trustee for a number of the city´s foundations – among which were Trondhjem Hospital, St. Jørgens Hus and the Waisenhus Foundation. For many years he was also treasurer at Trondhjems Katedralskole, Døvstummeinstituttet (Institute for the Deaf) and the Seminarii Lapponei Fund. Income from the various foundations, in addition to inherited funds for the sale of Elgeseter Estate enabled him to invest in property. In 1853, he bought the brickworks at Bakklandet, which was a sizeable industrial plant, and surrounding land. Schive also owned property at Hospitalsløkkan and together these properties made up an area of 53 acres. In 1832, he married Marine Sophie Wille (1803-89). The marriage was childless and in a will dated 26 October 1878, the couple established a trust, Christian Lorck Schive and Spouse Artist Trust. Schive died shortly after on 12 Desember 1879. The trust´s income was originally intended to benefit the trust founder´s nephew, the artist Jacob Oxholm Schive and any descendents. When the youngest of any eventual children reached the age of 25, 1/5 of the annual income would be assigned to the capital, while the remaining shares of up to NOK 1200 would annually be awarded to promising young Norwegian artists, primarily painters and sculptors. Income in the form of ground rent for the trust´s more than 90 leasehold sites on Lillegårdsbakken, along the river Nidelven and towards the Øya area today make up the basis for distributing the Lorck Schive Art Award. From the end of the 1800s and until the end of the 1960s the fund was administered by several generations of lawyers in the Klingenberg family, after that by lawyer Carl Flock until lawyer Gunnar Greger Hagen, currently a court of appeal judge, took over in 1987. The manager has always for all intents and purposes been the chair of the board and the general manager, under some supervision from the Ministry of Church Affairs and Culture, until the ministry in 2005 relinquished all responsibility and handed over the task of appointing a new board to the Norwegian Visual Artists Association (NBK). Until deciding to establish an art award, the trust opportioned a large number of small scholarships to artists under the age of 35. The distribution was carried out by the Norwegian Government Scholarship Committee. In recent years, the annual distribution of scholarships has totalled approximately NOK 600,000. Income is about NOK 800,000. Christian Lorck Schive was born on the Elgeseter Estate in Trondheim on 10 May 1805, the son of Adelgunda Christiania and Reinholt Johannes Schive. He had three sisters, Hanna Fredrikke, Charlotte Marie and Fredrikke Christine, born respectively in 1801, 1807 and 1810. He also had two younger brothers, Jacob Motzfeldt Schive and Johan Christian Vogelsang Schive who were born in 1805 and 1812. The large Elgeseter estate came into Reinholdt Johannes Schive´s possession through his wife, Adelgunda, who was the widow of the former proprietor, Hans Fredrik Klingenberg (1764-99), who in turn had purchased the property from his mother in 1796. Schive was also related maternally to the Klingenberg family. The Elgeseter estate extended to the Sluppen area in the south, included Øya and Nidarø with additional significant land southeast of the city at Singsaker and Gløshaugen. Reinholt Johannes Schive was born in 1767 and grew up in a wealthy family with long traditions in Trondheim. First mentioned in the city’s history is magistrate Lauritz Jenssøn Schive, in 1633. In 1688, his son, Jens Lauritzen Schive, became owner of Ilens Møllebruk (mill) and Ilsviken salmon hatchery, in addition to being court recorder and court judge in Trondheim. The son, Reinholt Jenssen Schive, took over the mill business in 1715 and ran it until 1724, before continuing as merchant and tax collector. He was also innkeeper and landowner in Ila. Pastor Jens Reinholtsen Schive in Orkdal, (1731-78), who married Marie Lucie Müller and had a son, Reinholt Johannes Schive in 1767, belonged to the next generation. After graduating from Trondhjems Katedralskole in 1787, he followed in his father’s footsteps and studied theology in Copenhagen. He got his degree but never practised as a priest. Instead he chose a life as landowner and property manager following his marriage to Adelgunda Christiana Gjertsen. In addition to Elgeseter, Shive´s property also expanded to the stud farm, Kuset, in Malvik. This included the mountain farm Schivevollen that in later years was used as a tourist lodge by Trondhjem Tourist Association and went under the name of Skivevollen. Adelgunda Christiania Schive was born in 1770, daughter of Captain Gjertsen of Huseby Estate in Leinstrand. She married Reinholt Johannes Schive one year after the death of her first husband, Hans Fredrik Klingenberg, in 1799. In the 1790s, Klingenberg had begun to parcel out Elgester Estate and Reinholt Johannes Schive continued this with the sale of sizeable sections of the estate. Several of the separated sections were purchased by town dwellers as country residences, among which were Singsaker, Lerkendal, Gløshaugen, Paulinegård/Valgrinden, Tempe, Valøen, Valsletten, Sorgenfri, Tilfredshet, Klosterdalen, Elisefryd og Nidarø. Schive was otherwise a noted writer in the city’s newspaper, Trondhjems Adressecontoirs Efterretninger where he wrote about the weather for several years. In his later years, Reinholdt Schive applied for clerical positions without ever being successful. He died in 1835, 68 years old. His wife lived until 1852. Christian Lorck Schive grew up with his five siblings on Elgester Estate. Even though several sections of the estate were sold in the early years of the 1800s, Elgeseter was still a large and valuable property and a substantial farm of 93 acres of which 85 acres was arable land. In 1819 the livestock consisted of three horses, 18 cattle, 12 goats and sheep and 18-barrels of grain were sown annually. The soil was described as easy to maintain. Following the death of Reinholt Johannes Schive in 1835, Elgeseter Estate was sold. For a while, it was owned by the firm Chr. A. Lorck & Sønner. Christian Lorck Schive was a cousin of the former owners of the trading company Lorentz Lorck, Paul Bahnsen Lorck and Jens Schive Lorck, and as a young man entered the operation as a salesman. In 1825, he left the family business and started as court recorder for the county governor Frederik Christopher Trampe and continued under the next county governor, Frederik Riis, who took over the position in 1833. 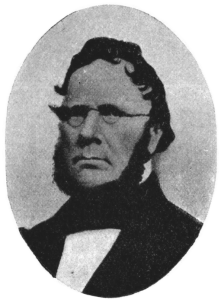 In 1837, Christian Lorck Schive became a trustee for a number of the city’s foundations – among them, Trondhjem Hospital, St. Jorgen’s Hus and the Waisenhus Foundation. Eventually, he was responsible for even more foundations and trusts, among which was Accountant Johan Christian Jensen’s trust, Steimann’s trust and Lars Testmann’s Foundation. In addition, from 1837 he was manager of the poor relief fund and continued in this position until 1858 when the county created its own position. In 1870, the manager position at Waisenhuset became a separate position and Schive then chose to continue as manager for the hospital. He played a key role in the reconstruction of the hospital buildings after the great fire in 1842. Among his other tasks, Christian Lorck Schive was for many years entrusted with the post as treasurer at Trondhjems Katedralskole, Institute for the Deaf and the Seminarii Lapponei Fund. In addition to his many public duties, Schive also managed his own private business ventures. Revenues from the various foundations enabled him to invest in real estate in addition to funds inherited from the sale of Elgeseter Estate. As early as 1839, he bought his own apartment building, Kongens gate 24, where he continued to live. In 1853, he bought both the brickworks at Bakklandet, which was a large industrial plant, and an area surrounding it. He only maintained ownership of the brickworks for five years, but retained a great deal of real estate in the areas of upper and lower Bakklandet, Christiansfeldt, Kristianstensbakken, Vollabakken and Vollafallet. In the latter location towards the river, he built his country residence, Luna, comprising two buildings in Swiss style. Schive also had property at Hospitalsløkkan and together these properties constituted an area of more than 53 acres. Christian Lorck Schive belonged to the city’s upper class both by virtue of his public functions and his own business ventures. Among other things, he highlighted his social position by his membership in the private club, Klubselskabet Harmonien, from 1838 and also through his marriage. In 1832, he married Marine Sophie (1803-1889), the daughter of the diocesan head and parish priest of Vår Frue kirke church, Hans Jabob Wille. The marriage was childless and in a will dated 24 October 1878, the couple established a trust, Christian Lock Schive and Spouse Artist Trust. Schive died barely two years later on 12 December 1879 but the will was not confirmed until his wife’s death on 30 January 1889. To establish the trust fund, hospital manager Schive gave his ”owned and tenured land”, in total approx. 53 800 m². Part of this was later sold such that the trust’s property was depleted to between 48 and 49 acres. The trust’s income was originally intended to benefit the trust founder’s nephew, the artist, Jacob Oxholm Schive (later written Schiwe), his eventual spouse and children. Following the death of the last remaining beneficiary, when the youngest child, if any, had reached the age 25, 1/5 of the annual income would be assigned to the capital, while the remaining shares of up to NOK 1,200 would annually be awarded to promising young Norwegian artists, primarily painters and sculptors. According to the conditions of the will, the selection of artists, would be made by the Ministry of Church Affairs. Christian Lorck Schive´s interest in art is probably due to his nephew’s talent and choice of career. But there was also another older artist in the family who may have influenced his interest. This was Karl Julius Lorck (1829-82), the son of his cousin, Jens Schive Lorck. Karl Julius Lorck was a pupil of Johan Fredrik Eckersberg in Christiania and Wilhelm Sohn in Düsseldorf, where he associated with the most famous of the Norwegian düsseldorfers, Adolph Tidemand. Lorck became a popular painter of the time and sold around 19 paintings to Christiania Art Society and regularly as prizes in Trondhjem Art Society raffle in the years 1856-1872. The artist Jacob Schiwe was the son of Christian Lorck Schive´s two-year younger brother, Jacob Motzfeldt Schive. The latter was born in 1805 and worked for the district recorder, Ingelbrecht Knudssøn, before taking his law degree in 1826. From then on he practised as procurator in Trømsø and served as acting bailiff and district recorder. In 1839 he was bailiff of Fosen and in 1855 bailiff in the district of Stjørdalen and Verdalen, as well as chief of police and magistrate in Levanger. In his latter office, he lived at Staup farm in Levanger as his official place of residence, where he died in 1877. Jacob Motzfeldt Schive was married to the diocesan head Willes´ daughter, Christiane Fredrikke, born in 1804, the sister of his brother Christian’s wife, Marine Sophie. Jacob and Christiane Schive only had one child, a son Jacob, born in Brekstad in Ørland on 19 February 1847. At the age of eight, Jacob Schiwe came to Staup farm with his father and mother, where the painter Morten Müller had grown up as son of the former bailiff in Stjørdalen and Verdalen, Morten Müller senior. Jacob Schiwe showed an early talent for drawing and painting and in 1864 came to Christiania where he was a student of Johan Fredrik Eckersberg for six years from the age of 17 until 23. The studies continued at the same place under Morten Müller in 1870-71 whom, together with Knut Bergslien, managed the art school after Eckersberg’s death in 1870. In 1872, Schiwe exhibited publicly for the first time in Trondheim at the exhibition of the newly acquired prizes for the annual raffle at Trondhjem Art Society. The same year, Schiwe moved on to Düsseldorf, where he studied under Ludvig Munthe. Through Eckersberg, both Müller and Munthe were influenced by the düsseldorfers romantic approach to the landscape that included some adaptation and beautification of the subjects in the atelier. Schiwe is considered to be Trondheim’s fourth düsseldorfer, even though he was educated later than the others and after this school was in vogue. In addition to the aforementioned Karl Julius Lorck, Hans Jahn (1834-1902) and the lesser known Johan Martin Berg also belonged to this tradition. After leaving Trondheim in 1864, Jacob Oxholm Schiwe only sporadically visited his hometown. He lived in Denmark from 1885 where he built a house in Snekkersten close to Helsingør. For a period, he also lived in Dresden and was often on study trips to France, Italy, Germany, Denmark and Norway. He was, however, not forgotten in Trondheim. His paintings were purchased a total of eight times for the Art Society raffle, in addition to four acquisitions for similar raffles in Drammen and two for the Christiania Art Society. The majority were landscapes, mostly autumn and winter, which were his preference. In this way, one was reminded of his tutor, Morten Müller, but Schiwe also painted fresh and summery coastal studies, among which was ”Hus ved stranden” (The house by the beach) which was purchased by the National Gallery. 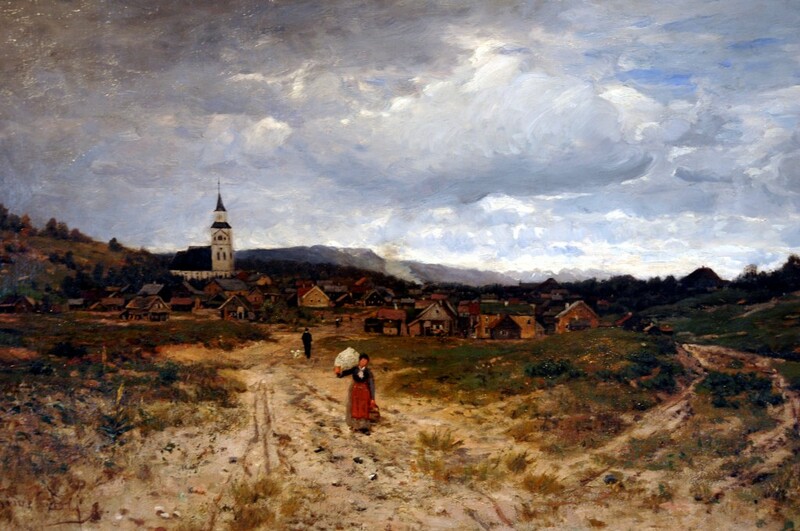 In Trondhjem Art Society’s permanent collection (Trøndelag Kunstgalleri), now known as Trondheim Kunstmuseum, there is one of Jacob Oxholm Schiwe´s works, the painting ”Vinterlandskap” (winter landscape) from 1879. It was purchased by the Consul H.F. Klingenberg and spouse endowment in 1927. Otherwise, as a result of raffles, a number of his paintings were scattered throughout the private market in Trondheim. Among which it is known that a large Røros scene is in private ownership and a scene from his uncle’s property Luna in Vollafallet facing the cathedral. Jacob Oxholm Schiwe exhibited at the Nordic industrial and art exhibition in Copenhagen in 1872, at Kunstverein in Berlin in 1874, at the World Exhibition in Paris in 1878, the Nordic exhibition in Gothenburg in 1881, at Charlottenborg in 1883 and the Chicago World Fair in 1893. He made his debut at National Art Exhibition (Autumn Exhibition) in 1894. Jacob Oxholm Schiwe lived the remainder of his days in Vestre Gausdal and Lillehammer where he died in May 1912. Brodahl, Joh. E.: Tre århundres trønderske maleri, i Trondhjems Kunstforening 90-årsskrift, Trondheim 1935. Grankvist, Rolf: Nidaros kirkes spital. Trondhjems Hospital 1177-1977, Trondheim 1982. Grimelund, Josef Jervell og Olav Flønes: Trondhjems Kunstforening 1845-1945, Trondheim 1955. Lie, Magnus og B.M. Tvete: Stiftelser og legater i Trondhjem, Trondheim 1923. Lie, Magnus: Waisenhusstiftelsen i Trondhjem, Trondheim 1935. Schmidt, Olaus: Slekten Schive, Trondheim 1917. Schmidt, Olaus: Schivevollen, i Trondhjems Turistforenings årbok 1959. Strinda bygdebok bd. 1, Trondheim 1939. Thaulow, Christian: Personalhistorie for Trondhjems by og omegn, Trondheim 1919.